Location: East Riding of Yorkshire, England. Ownership / Access: Private, farm. Notes: Wressle Castle was a quadrangular castle originally built for Thomas Percy in around 1380. 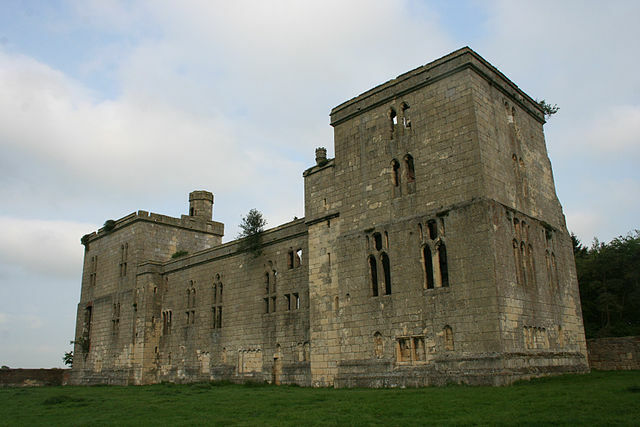 After the death of Henry Hotspur after the Battle of Shrewsbury in 1403 ownership of the castle passed to the crown, then to John of Lancaster, 1st Duke of Bedford. In 1457 Thomas Percy, 1st Baron Egremont obtained the lordship and castle of Wressle for his lifetime. Subsequently the castle then passing to the Earls of Northumberland until Josceline Percy, 11th Earl of Northumberland (d.1670 without male heirs). The castle then passed to Charles Seymour, 6th Duke of Somerset by his marriage to Josceline Percy's daughter Elizabeth Seymour, Duchess of Somerset. The castle was visited by Leland in the 16th century, and described in his itinerary: The basse courte (literal 'farm yard', outer court or bailey) was mostly of timber, with a moat on three sides, the fourth side had the castle's entrance. The castelle (main castle) was of stone, much of which was thought at the time to have been brought from France, with five towers; four at the corners of similar size with four stories, and the fifth over the gatehouse with five stories; at the time (1530s) the castle was in good condition. The moated gardens include opere topiario (topiary) in spiral shapes. The castle was garrisoned by parliamentarians during the English Civil War during which time it was badly damaged. Subsequently the castle was slighted by order of parliament (1650) with three sides torn down, and all battlements removed. The castle was later used as a farm house until 19 February 1796 when a fire broke out, caused by the deliberate starting of a chimney fire in order to clear the chimney of soot, resulting in the gutting of the building. Wressle Castle is now a Grade I listed ruin and a scheduled monument. Remains include earthworks indicating the moat, and some parts of the castle: the remains of the two towers of the south range; and a building fragment, thought to have been a bakehouse.